One of the reasons cancer is so successful and difficult to treat is that it uses the body's own systems to proliferate, thrive, and hide from attack. Bioresearch scientists out to target cancer are taking a similar approach, building tiny bio-vehicles for locating tumors that reach their destination without setting off a massive immune system alarm or flooding the whole body with toxic chemicals. 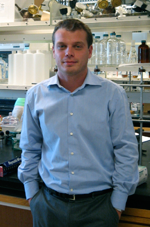 A team of biochemists at the University of California San Diego led by Dr. Nathan Gianneschi has developed a nanoparticle that assumes a benign shape to travel covertly through the blood system, then, recognizing a tumor, reassembles via an enzymatic cue into a net to attach itself to the cancerous target. Bioengineers at the University of California San Diego have come up with a novel way of removing dangerous toxins from the bloodstream using biomimetic nanosponges. These tiny clean-up particles work by posing as red blood cells, which serves both to evade the body's immune system response to foreign invaders and to attract the toxins to themselves instead of to actual red blood cells. When the toxins have all attached themselves to the nanosponges, they are processed out through the liver without harming the body. The research into this promising therapy comes out of the Zhang Lab in the Jacobs School of Engineering, where in 2011 they pioneered the red blood cell disguise technology for cloaking cancer drug cocktails, allowing the drugs much more time in the body to target diseased cells. 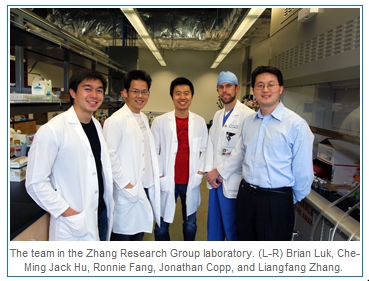 Dr. Liangfang Zhang is also on the research faculty of the UCSD Moores Cancer Center.